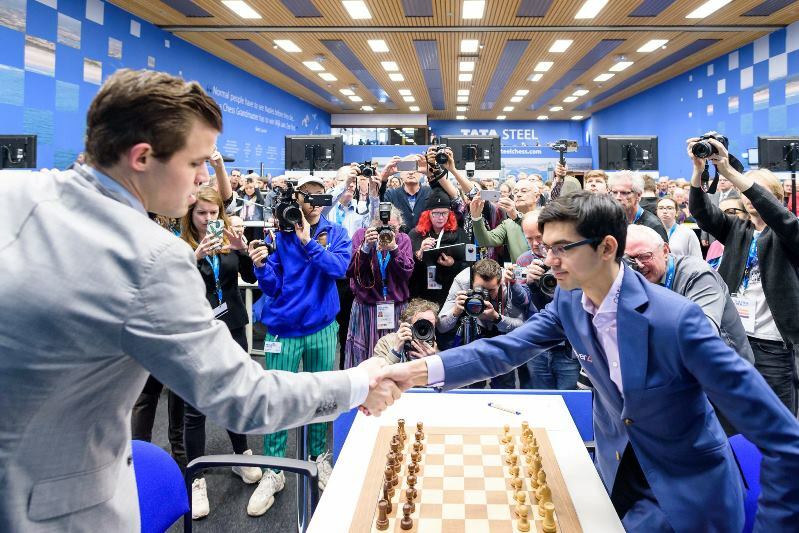 Anish Giri gave a 70-minute interview to Jan Gustafsson after matching Magnus Carlsen’s five wins in Wijk aan Zee for a second year in a row. As well as discussing the tournament they talk about the retirement of Vladimir Kramnik, who Giri seconded at the Candidates Tournament in Berlin last year. Giri reflects that Kramnik is likely to be hungry to play again in another few months, though he doesn’t expect him to go back on his decision. Giri also talks about the current balance of power in world chess and how quickly things can change. We’ve put together some highlights for those who prefer to read or struggled to follow Giri’s rapid-fire English! I was very surprised, obviously, but I cannot say that I was completely shocked, because I know Vladimir quite closely recently. As you know, I helped him at the Candidates. We had a lot of talks about things. Obviously he never, or I never, brought up the topic of quitting or something, but in hindsight many things that he said explain some of his reasoning - let’s put it that way. 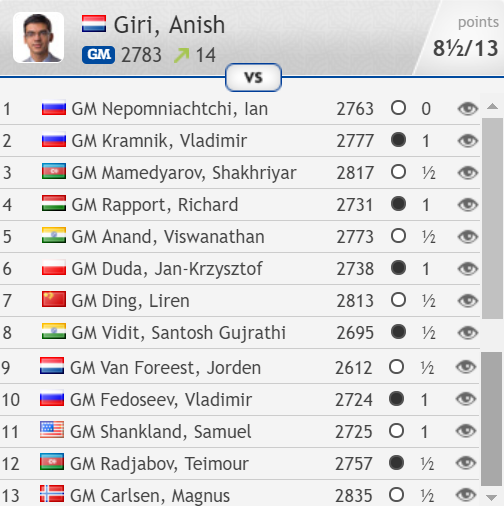 Did Giri losing 7 games to Kramnik, but then winning the last 3, have an impact? Yeah, that’s quite funny! You could say that after a player as great as Vladimir loses three times against me he thinks that’s sort of the rock bottom, but in fact no, of course things like this happen a lot, because chess is a very psychological game and, as you probably know yourself, these struggles are more than just moves. Of course if somebody can get into your head then often you have these sequences of games and you play awfully. For example, these games that I played against Vladimir, the first seven that he beat me, he played so good in all of these games. They’re not only instructive, but also high quality on his part… I was actually even thinking to annotate a game that I lost against him, because I thought before he announced his retirement I would annotate the game where I beat him, but then I thought, ok, it’s more appropriate to annotate a game where I lost. But I just couldn’t choose – there are so many great games I lost to him! Recently, of course, at some point it turned a little bit. He no longer has the same confidence against me. These things went this way, but obviously I’m sure if he hadn’t quit he would still have beaten me many times. Was Kramnik Version 3.0, who never stops trying to beat you, scary to play? For me it was not scary, because after somebody beats you seven times you’re scared to death already. We tried addressing these so-called “issues”, or you can call it “a version”, before the Candidates Tournament, because he already started overpressing quite hard before the tournament, and I was trying to help him there to maximise his chances, and he was kind enough to have some discussions with me. Obviously, as you can see from the tournament and the way it went, there was absolutely no influence of mine in his decision-making, but I indeed saw many downsides of this new style from the inside. I couldn’t do anything about it during the tournament and, as you saw after, I won two games against him - you could say I benefitted from it myself. In general these things about styles and versions of people and so on… it’s easier said than done! There’s more to it than just playing for a win or not playing for a win. It all comes from deep inside and it’s very hard to change one’s true self. I was more familiar with other systems, but I decided that since I assumed he doesn’t know anything about the Pirc I could try and catch him off-guard and play something more aggressive than I usually do, and I knew some sort of bare minimum about this position, because I once was giving a pep-talk to Sopiko about how she should treat the Pirc with Black, because she played it on a few occasions. I knew some basic ideas for Black, but I never gave her a pep-talk on how White should treat this position, so I didn’t really know what to do! It’s very unpleasant to show yourself so vulnerable, at least in the first game, because obviously myself and hopefully my colleagues know that I can play chess sometimes, but when you lose so badly it’s tempting to think you just take the guy slightly out of his known path and you’ll beat him. As you know, when you are considering certain moves they get into your system and very, very often people make the move that they feel they should have made earlier at a later point. That’s a funny thing that really many players are guilty of. Yeah, or some people simply have obsessions. For example, Levon has an obsession with Kh8, Ng8 – he did it today as well? An obsession of going Kh8, Ng8 and pushing f5, in whatever opening. It’s a good plan, most of the time. Or some people have h6, Nh7, or some people they love to go Re1, Bf1, some people love to go h3, some people love to go Kh1, and these are moves that are often very good, but sometimes they can be played in a completely wrong circumstance. I remember one time I played Magnus I played Re8, Bf8 in a position where it made no sense whatsoever. The bishop was better on e7, but I just made Re8, Bf8 pretty quickly, and it was terrible. You have these things, but of course most players, especially those who are ambitious and trying to improve, they analyse their games and then they notice these things and they try to get rid of these obsessions, so to speak. Well, if Re8, Bf8 is your worst obsession you’re doing fine – that sounds useful, normally? Yeah, but I lost that game against Magnus – the position went from equal to lost in two moves, after Re8, Bf8. Chess is a complicated game! You can’t always play Kh1 and be happy, or you can’t always play Kh1, Ng1, but in this case it makes the game difficult, because there are all these standard ideas but you need to know when to implement them. Giri said, "I don't even think I managed to keep my face straight" about Kramnik's 25.Qf5?, dreaming of 25...Qxd4 26.Qxf7+ Kxf7 27.Bd5#. "I wanted to tell him, "Come on, Vladimir, you know me, I know you, you know I'm not falling for it. Why are you doing this? What have I done?" It’s very unfortunate that he stopped playing, because he could have first of all continued playing like he does and still bounce back, because this time he was just in particularly bad shape and so he was missing a lot of things, but if he would be a little bit sharper and it could be a much better day he could have scored a plus score. So first of all, he could have bounced back without doing any changes, and I don’t know if bounced back to the Top 5, or the Top 10 or the Top 15, I don’t know how far, but he could have done that. 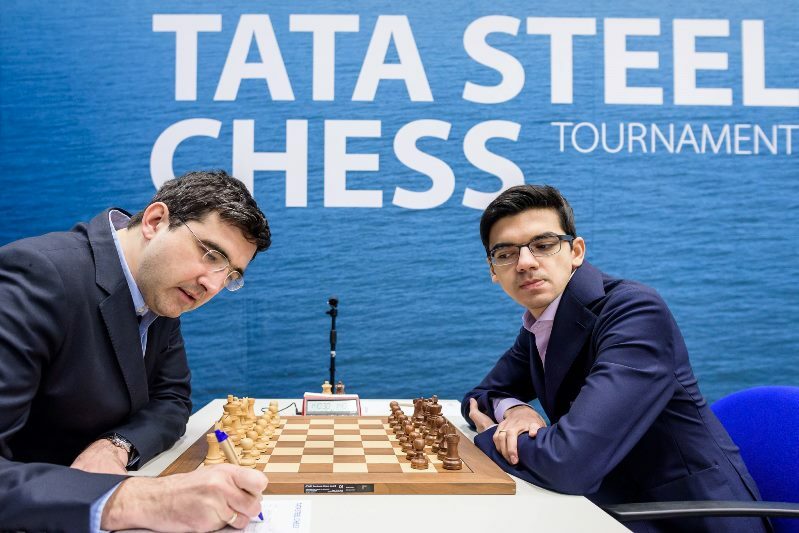 He could have also tried to make adjustments, compare himself to his older self, to Vishy Anand, who is also very experienced and yet he plays at the highest level, just try to make some adjustments and continue playing. Then I think also he would be bound to be back, and he would definitely make it to the Top 10 and stay there for a long time, but I think he simply didn’t see the point, because I cannot imagine it, but I can sort of understand that if you have been World Champion for many, many years and you’ve beaten Garry Kasparov, then the thought of coming back to the Top 10 is not really very seductive - although for me, from where I am right now, it feels like, “well, what can be better than that?”, but of course I understand him, that he just doesn’t care to make this sort of a comeback – what for? Especially if he has some other things he wants to pursue. 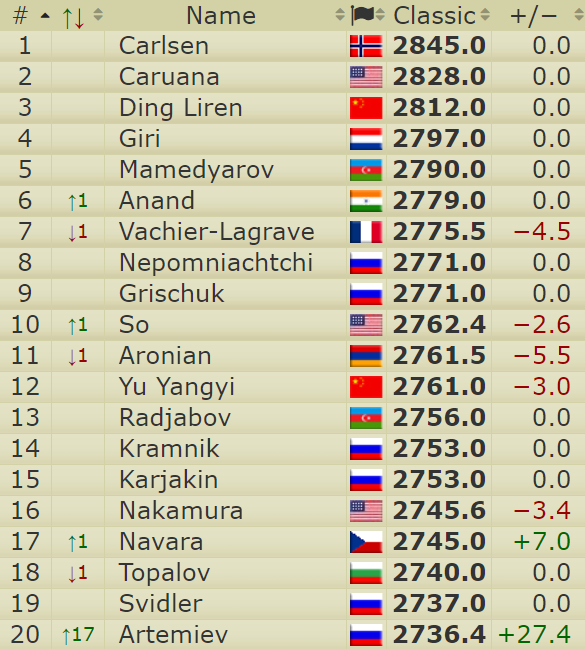 Was it just hard for Kramnik to keep going, preparing for games, after 30 years at the top? I actually don’t have that experience. I’ve played chess for a long time, I think. In competitive chess it’s maybe 10 years that I played, and of course 30 is not 10 and yeah, that is a lot of years. I don’t know, maybe I will also be fed up or I don’t know what, but I have a feeling with Vladimir that after about four months or something he’ll probably again be hungry to play. I don’t know, I would think so, but maybe not… I have a feeling that he’s not going to be back, but I think he might want to be back! I don’t think he will be back because he doesn’t strike me as the guy who once taking a decision like this will later reconsider it, but he might feel like he wants to play and then think like, “well, I cannot play because of what I’ve said, that I retired”. But there’s always a way. Garry Kasparov even now made a comeback, and Vladimir didn’t promise anything to anyone, so if he wants he can also participate maybe in the Sinquefield Cup in the rapid. Maybe there will be an event like with Kasparov this time also with Kramnik, and we’ll have two retired legends playing. There’s always a way to get back to the game. Sandwiched between a win after a one-move blunder by Rapport, Giri was faced with impressive opening preparation from Shakhriyar Mamedyarov and Vishy Anand. Vishy after his Round 5 game against Giri - it turns out both players had missed that Black was better in the final position since 22...Qxb5! 23.Rxf7? loses to 23...Rg6! I think he’s working very, very hard. I wonder to what extent is he deep… because I assume that when you prepare for a World Championship match you want to have it all covered pretty much, so you are really carefully looking at all the lines and all the options. I guess sometimes he’s bluffing a little more nowadays, but he’s definitely still able to surprise the opponents, and I think that has become his priority – not to be caught and not to be surprised, because I guess he doesn’t like when he has to remember something when his opponent doesn’t have to and, like most players, he’s definitely under pressure when he has to memorize and show some forced lines, but he’s navigating his way through the openings very well recently and it’s very hard to catch him. It’s always a nice challenge for me to try to catch him off-guard, but unfortunately recently it’s been already a few times that I wasn’t able to, so I was thinking Wijk would be the one where I’d manage. To be honest, the Italian was a little bit of a naïve choice, perhaps, because he’s a specialist there, but I had my ideas. It’s not like I went empty-handed there, but I was not able to catch him and I think he’s very well-prepared and I think it’s one of the secrets of his success – not only that you are well-prepared and that you play some novelties and get an advantage or make a forced draw, but it’s more that when you work hard you feel confident because you know you’ve put in your hours and you’re also more familiar in the positions and it’s just an overall confidence thing and I think he sticks to that. At least that’s the impression and I’d be shocked if he’s not hard-working. One of my favourite short bits of rhymes from the Russian poet Alexander Pushkin is when he says, “Oh, it’s not hard to trick me! | I’m myself happy to be tricked!”. It’s a little bit of that. If you want to play g3 on move 3, just do it! 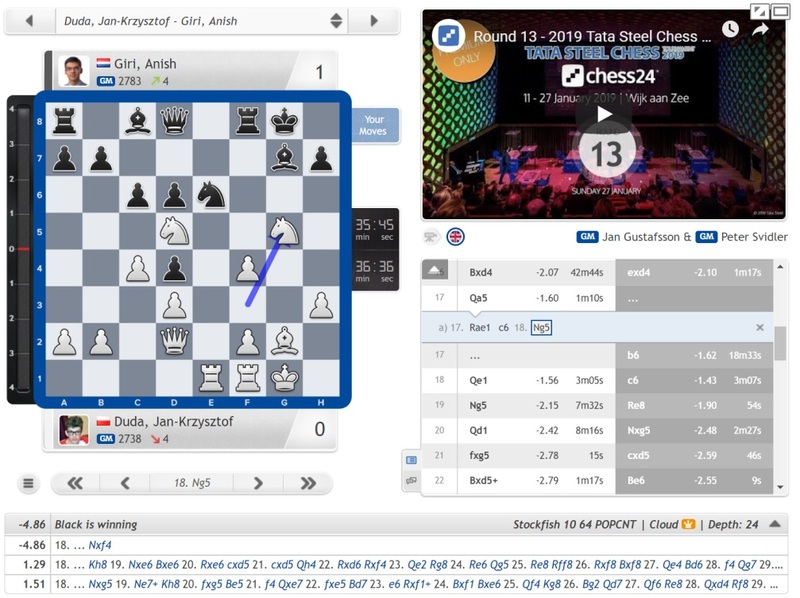 Duda thought for over 40 minutes after realising his mistake, with Giri praising 17.Qa5! as “a great defensive idea”, though ultimately it wasn’t enough to save the game. I think he did well. The amount of points in general doesn’t look impressive, but it’s much easier to criticise than to achieve. The amount of points is not that big, but every game that he played he was a massive underdog. So you could say his expected score was going to be 4 points, but in fact his expected score if you look game per game was more or less zero! With colours also he was not too lucky. He had White against Magnus, but then for some reason – or not for some reason, for good reasons – he’s going all-out against him, doesn’t want to play it safe, but then of course if you’re asking for it against Magnus you’re receiving it, usually. So he received it! He had many tough black games and many tough pairings. I think he scored very well, but simply the fact he won three games against the top players is very impressive. I think he did well. Of course it could have even been better at some point. For example, he could have abused Kramnik’s bad form, because he gave him some chances. As I said, he could have been a bit more cautious with Magnus in the opening. I’m sure if that was his goal he would have managed to hold that game as well. It was quite funny. I had a conversation with Shankland and Magnus, I just caught them talking to each other, and Shankland said that, yeah, well, what Jorden did makes sense, because you want to play a game against Magnus. What I did, (because he played a very solid game against Magnus and got a draw) I didn’t get any pleasure from that. Then I looked at Shankland and Magnus and I just realised that because of people like that he gets all these points! Of course if you play with the intention of learning or playing an interesting game it’s going to be difficult. 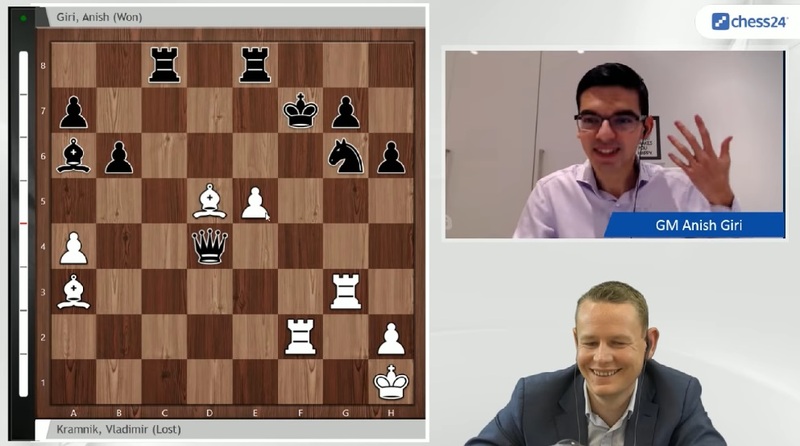 Jan: Do you think Jorden got any pleasure out of his game against Magnus? No, I don’t think so. He did get a lot of followers after the tweet he sent, so maybe it was his plan all along. I was actually even thinking, what do you learn from such a game? I think you learn that next time you are more cautious with the white pieces. It’s hard to say. Of course Jorden’s career will be long and there are many more games to come with Magnus and other players, and in that regard all these experiences are very useful. We have a viewer question from @jordenvforeest. He’s asking how seriously are you taking our cold war on Twitter? Very, very seriously. I had this beef with Magnus and now I have also one with Jorden, where it is good for my diversity. Because with Magnus I’m the one who’s down and is biting upwards, and with Jorden it’s the other way around, so I’m trying to get more versatile in my trash-talking abilities. 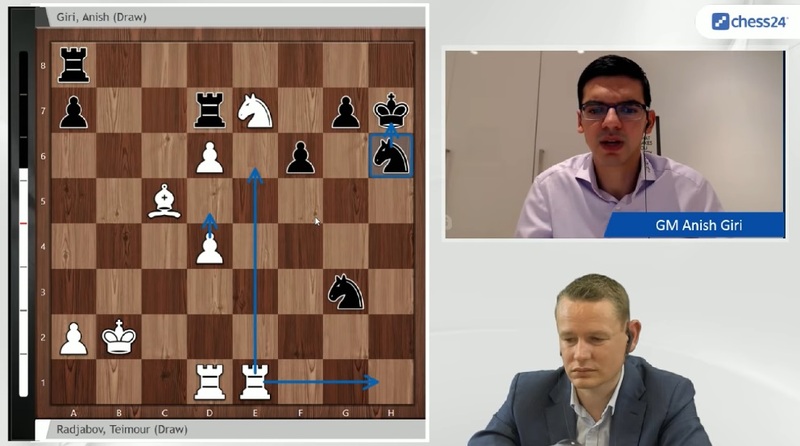 Did Giri think Sam Shankland would actually resign in a drawn position after 45.b6? Since he was so upset and his body language was the body language of a person who is losing I thought there is some chance, but of course I was even scared to dream of it! He was sort of thinking, “how am I going to win this position?” and he tried to see a forced winning line, and there wasn’t [one], and then he saw I have two outside passers as well, but I realised that I was lost because I had to actually make moves! 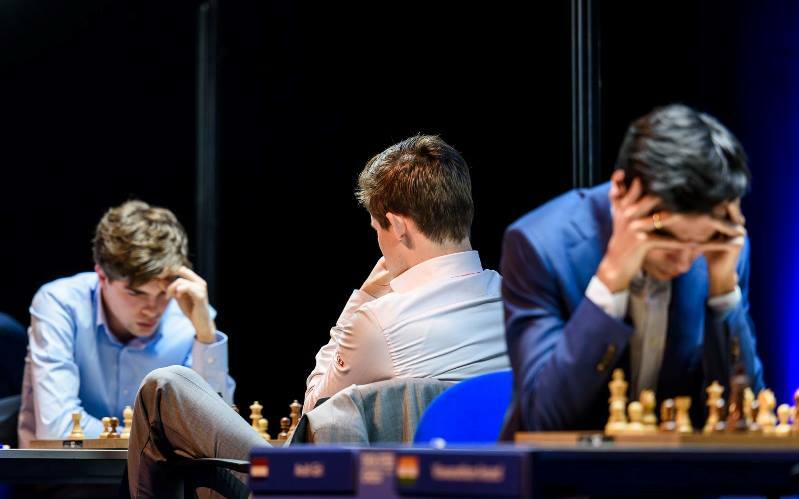 And for the past two moves I was planning on what moves I was going to make, and then I realised I don’t know what moves I was going to make, and then I realised that was the problem of my position. Was 20.Be2!? against Magnus a sign he was willing to take huge risks to win? The reasoning goes wrong at the moment that I didn’t realise the risk I’m taking, probably, although it’s of course part of your psychological mindset. Of course if beforehand you’re really trying to do something then – that’s also why, for example, Kramnik used to take such big risks, because he justifies them in his head somehow. I had the same thing. I knew this motif, of course, it’s basically a theoretical exchange sac, but in that version I’m like three tempi up… but I thought that despite all of these things the evaluation should not be I’m lost, because I have the light squares still and I still have my knight on d5 and I will have the a6-pawn. So I sort of thought I might be slightly worse, but he’ll be so shocked that I did this that he might be a bit tilted and make a couple of weird moves and then I’ll be back on track and have an equal position. And then I might outplay him, because my position is easier to play, I felt, because I have the light squares, but I misjudged the dynamic potential there probably and I also didn’t expect Magnus to play so well afterwards, because he played very dynamically. He went f5 and then Bd2 and he just played very well and didn’t seem to be too disturbed by my decision. Was Giri happy with his overall result? Yeah, it’s incredible actually. After last year I even said, somebody asked me, and I said the exact phrase that, “winning five games at this level for me is not doable again so easily”, but then actually I won five games. It’s quite funny that I managed to do well twice. I’m very happy, because if I had only done it once you would always feel that there was this one year when I had some insane boost and won five games, and for the rest I’m doing ok at Wijk. But now I’ve had two good tournaments and that makes me very happy. Did Giri play too sharply in 2017 because of criticism of being a “draw-meister”, then improve in 2018 when he played more cautiously again? Possibly. It’s not so much the criticism from the outside, which I can deal with pretty easily. It’s more that I think I might have got at some point a bit unrealistic expectations for myself, because it was not even the fact that I drew the games but I scored 50% in some tournament and I feel like, “what’s wrong, why am I not winning this tournament?” But look, it’s a little bit odd to assume that you have to win a tournament necessarily, or you have to win certain games, and then I was actually misconverting many positions as well, because I was putting way too much pressure on that. And like Teimour also in this tournament, the reason he offered me a draw - after that he told me, “I misconverted one +5 position, so what is this compared to that?” That kind of logic is very flawed and shouldn’t be used, but also simply people have good streaks, bad streaks, and nobody’s alien to that. The best players in the world… Magnus and Fabiano, also Levon used to be the world no. 2, they all had their streaks. Hikaru, for example, he’s now in a slump, and you can try and justify why and try to do the Freud and say whatever happened in his life is affecting him, maybe the fact that Bitcoin is not going well or something, and you can sort of make all kinds of reasoning, but at the end of the day of course it’s all a bit of a circle, you’re just not doing well and the lack of confidence keeps you stuck there… There’s definitely some truth to what you are saying, but I wouldn’t put it that simply. It’s a bit of too simple a story to be true. I have a secret wish to become a World Champion by only making draws and never winning tournaments – I’ll prove all of them wrong! That’s my secret wish. How do you see the position in top chess now? Carlsen, Fabiano and the rest? Things change so fast. For example, we are now saying Fabiano, but already a few months passed and we don’t really know what he’s been up to. For example, I wouldn’t know what kind of situation he’s in. Let’s say you’re going upwards and reaching this pinnacle of your career and playing the World Championship match, and just at the last moment you stumble and don’t make it. Now how motivated are you to start all over again from the start? It’s a big question. For example, Sergey Karjakin struggled, obviously. He’s had a tough period ever since, pretty much, so we don’t even know how he’s doing. For example, Shakhiryar, he had a very stable period as well, and now he’s suddenly dropped out of 2800, which seemed unimaginable. I saw a picture the other day on Twitter which was sort of retweeted now from ages ago when the photographer said Shakhriyar and then called him a stable 2800 player, which he obviously looked like and then in one tournament he managed to drop out, so everybody can have their dips. Even Magnus, now he’s once again the great thing but back in Wijk at some point he was setting the records on the longest drawing streak and it seemed like he would draw forever. Did that please you a bit? Please!? I had the best time of my life! And I was so happy the game of Jorden comes already after Magnus passes the milestone, and still I gave Jorden instructions, you might have noticed. I really tried to put him on the right track, but he ended the streak. These things they flip very fast. I also see many people who in my position now would give you a whole lecture on how it was very important to fix a certain thing and now I’m a better and better me and now I’m on my way to the world title or such, and then after giving such an interview and playing a few other tournaments they just drop back to who they always were. Things change very fast. I think that’s also the nice thing with the ratings that the system is very fluid. Magnus remained no. 1 for a long time first of all because he’s always had the gap, but also because he always managed to perform reasonably well. He really performs pretty decently even in his worst moments. Other than that rating is very fluid and people come in, come out. Levon Aronian used to be no. 2 and right now he’s barely top 10, but again maybe he’ll win some tournaments and he’ll be the guy again. It goes all so fast and top chess is so difficult. I think it’s a bit like you have a pack of people who are running and then they are running like a marathon and the thing is that you always have to keep running, because if you stand [still] even everyone else who was much behind you they keep running and they’ll run ahead of you. So, for example, I don’t know if Fabiano is running now, in that sense. Everybody has to always go forward - to stay in the same place you also have to go forward, in my opinion. So it’s very hard to say right now what the situation is. It’s changing, but then it’s always easy to make stories - for example, after somebody qualified you can write his whole life story and how he worked towards his World Championship match, but the same Karjakin or Fabiano can come pretty much out of nowhere at some point, so it’s so hard to say. As a top professional player myself I’m just focussing on my own events and trying to do well and see where others end. It’s good to see that FIDE is doing so well with the qualification tournaments. They’ve also added the budget there, so it’s more attractive for professionals to play, because of course they could also have chosen to sort of force the players to play simply because it’s a qualification to the Candidates, but they’ve also stepped up the prize fund, it seems. I haven’t yet seen the details, but I just heard and I assume they didn’t lie about it. It’s definitely better for the professionals now. So you like what you’re seeing out of the new FIDE leadership now? …what I can sort of judge is the World Championship cycle. It looks right now like they’re doing something interesting. For example, I’m not sure the knockout system in the Grand Prix, how that will work out, because first of all it’s not so easy to schedule things. For example, I go to a tournament and I don’t know if it will take me one week or three, and then I don’t know how to plan the rest of the month, and things like that, and I don’t know how exciting it will be for the public or to what extent the winner will be decided by luck or by rapid chess, or by blitz. It’s all hard to say, especially when you experience new formats you only see the downsides and the upsides after they take place, but they’re definitely trying, so that’s good to see. As I said, the prize funds are also improving, which is very important for the top chess. Is seems Giri doesn’t watch TV shows or play videogames. Does he have vices? You’re an Eminem guy? I was surprised that you’re into rap. Magnus Carlsen: "I'm living a lie!"